This cute and clever cat sitter thank you card is perfect to give to a pet sitter for taking care of your cat while you were away. This card can be fully customized and personalized at no extra charge and also includes a free matching colored envelope, round envelope seal, and a U.S. Forever postage stamp. This personalized cat thank you card has an illustration of a cat bowl, paw, heart, cat and fish bone. On the front of the card there is the message "Thank You for Pet Sitting My Cat While I was Away". 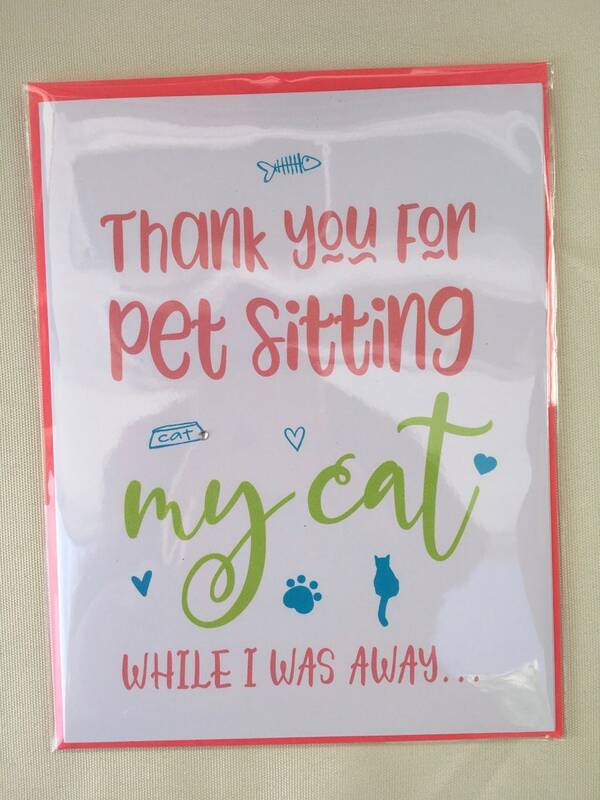 The card is also available with the plural message, "Thank You for Pet Sitting Our Cat While We Were Away". The card is blank on the inside and measures 4.25” x 5.5”. Your handcrafted, cat sitting thank you card will be individually printed in my home studio so you can further personalize it by adding any name you wish on the back of the card as shown on the photo. Provide the name(s) you want printed in the Notes section.